M&M Acres is a Nonprofit 501(c)3 Charity. Our NFP tax ID number is 8322579723. Thank you for your continuing support and contributions! Rescuing large animals is an expensive endeavor. Unlike a small animal shelter, the items we need are not as simple as newspaper or old blankets. The items needed for farm animals are larger and higher dollar. The cost of rehabbing one average weight, fairly healthy horse is approximately $400 per month. 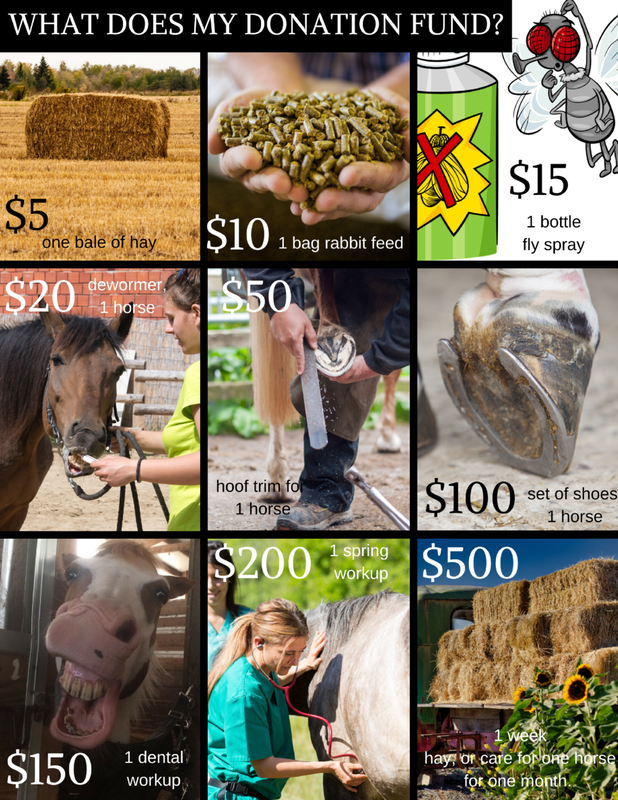 Horses that are malnourished or require extensive vet care can increase to well over $1,000 in their first month here on the farm. You can make a financial donation through PayPal by selecting the YELLOW DONATE BUTTON above. We have some exciting NEW opportunities to become key contributors to our rescue mission - STAY TUNED! Supplies - Heavy duty scrub brushes, Dawn (only Dawn brand) dish soap, Rubbermaid bins, brooms (no dustpans necessary), cleaning supplies, toilet paper, paper towels, halters, lead ropes, blanket repair services, muckforks (plastic head), plastic play yard, and cat food. Tools - 12g extension cords (must have lighted ends), sinking water trough heaters, zip ties, duct tape, contractor (Husky brand or similar) garbage bags, box cutters/knives, screws (various sizes), lag bolts, washers, treated posts (10' length - 4x4 or 6x6), auger, plywood (4x8', 3/4"), etc. Services - Plumbing, electrical, carpentry, handy man and tractor repair skills. We are looking for someone to build a fire pit. TIME: We also love when someone is able to donate their time to create an event flyer, business cards, printing and help with PR and advertising. We appreciate gift cards to use at our vendors for supplies, and donations can be made directly to our veterinarian to cover medical care for the animals. Big R or Farm & Fleet gift cards are highly appreciated. Ludwigs (13205-131st St, Lemont). Gift cards here are appreciated tremendously, as this is our largest expense! All our grain and shavings are purchased here. Ludwigs is also family owned, and we love to support locally-owned businesses! Gas gift cards help to keep our tractor running and cover costs when we drive to pick up animals. Interested in getting virtual “behind the scenes” access to M&M? Consider joining us on Patreon - a monthly donor platform to help us continue to create a haven for animals in need of rescue, rehabilitation, and healing. Check it out via the link below!